The international conference “Geopolitical Change in Central Asia and the Southern Caucasus: Which Future Role for Europe?”, organized by the Institute for European Politics (IEP) and the Centre international de formation européenne (CIFE), will take place on 3-4 July 2017 at the premises of the Representation of the European Commission to Germany (Unter den Linden 78, 10117 Berlin, Germany). We are especially pleased to welcome the EU Special Representative for Central Asia H.E. Ambassador Peter Burian as a keynote-speaker on the second day of the conference. He will speak on the “Prospects of EU-Central Asia Relations”. The conference will involve well-known experts and high-ranking decision-makers as well as young researchers who will discuss together the role of global and regional powers in Central Asia and the Southern Caucasus, as well as the consequences for EU’s future policies towards both regions. It includes discussions about a new start for the relations between Russia and the US and its implications for Central Asia and the South Caucasus and the role of the “late global power” China. Against this backdrop, the participants will discuss the EU’s strategic priorities in both regions during the next years. 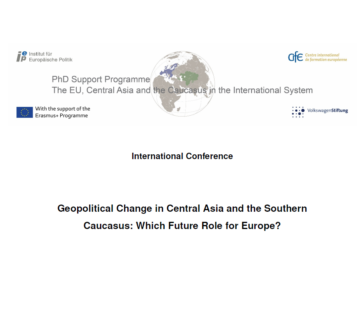 The conference takes place within the framework of the PhD Support Programme “The EU, Central Asia and the Caucasus in the International System” (EUCACIS) for Postgraduates and Doctoral Researchers in Central Asia and the Southern Caucasus, organised by the Institut für Europäische Politik (IEP) and CIFE. Funded by the Volkswagen Foundation and the Erasmus+ programme, it offers three-year scholarships to excellent postgraduates who are working on a doctoral thesis in political science, contemporary history or economics on a topic related to its thematic focus at a university or academy of sciences in the Southern Caucasus or Central Asia (including Afghanistan, the Kashmir region in India and the autonomous region Xinjiang in China). More information on the programme is available on this website.